“People First”: It needed to be a place that would encourage the health and well being of employees, help attract and retain talented people and reflect Pacific Northwest values. "The Building is the Park”: Consistent with surroundings, it needed to engage the park and trees that encircle the building’s site. Fiduciary Responsibility: It needed to demonstrate the not-for-profit, member-owned credit union’s financial stewardship. The five-story, 156,000-square-foot building ended up with cross-laminated timber (CLT) roof and floors and simplified support for the exterior façade. Glued-laminated timber (glulam) was used for the post and beam frame and columns. 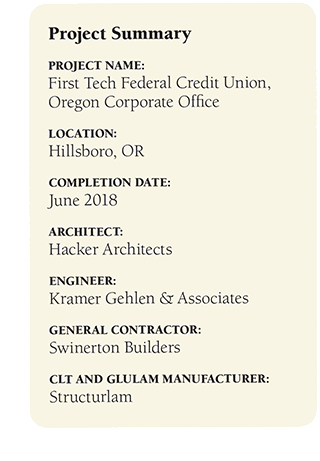 While Portland-based Hacker Architects had used glulam beams for decades in western Oregon, the use of CLT was relatively new. They had been looking for the right opportunity to use it, consulting with WoodWorks–Wood Products Council. Swinerton Builders was tasked with demonstrating to the owners that they could save time and money using mass timber over a conventional structural steel frame. “We allowed steel to compete with mass timber throughout the evaluation,” said William Silva, Swinerton preconstruction manager. 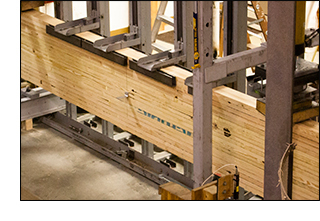 “From time to erect, fireproofing, foundation systems, and other criteria, wood came out on top every time.” Using wood, prefabrication and a coordinated team approach resulted in 4 percent cost savings and four fewer months of construction over the use of steel. The owners liked the idea of wood and the way it would reflect a warmth in the work space, promote health and well-being and feel natural and consistent with the park outside the floor-to-ceiling windows, but they wanted a clean look without visible mechanical systems. That meant more than 4,200 mechanical, electrical and plumbing penetrations in the CLT. A virtual model of the entire First Tech project was built before construction started. Structurlam, the CLT and glulam manufacturer based in Penticton, British Columbia, partnered with Kramer Gehlen & Associates (engineer of record), Equilibrium Consulting and MyTiCon to implement a hidden connection design. Pre-engineered connectors were installed and all utility penetrations were cut at Structurlam’s facilities. All the components were delivered to the construction site as ready-to-assemble prefabricated parts. The columns and panels snapped together on site with hidden connectors, and the utilities are hidden under a raised floor, leaving a clean design that draws the eye to the wood and windows. The preplanning and offsite hole-drilling made the onsite construction faster, safer and quieter. No saws for field cuts. No drills for mechanical and electrical penetrations. No equipment back-up alarms. Just a small crew with a crane. The five-story building was phased so the tradespeople could work consistently from one end of the building to the other as the floors, walls and roof took shape. “Passersby would ask where all the workers were,” said Zach Davidson, P.E., S.E., the project’s Kramer Gehlen & Associates senior engineer. 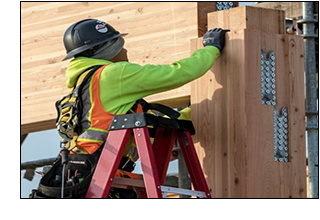 Construction for the largest CLT structure so far in the U.S. took 14 months total, with only 12 weeks needed for the timber erection. Visitors to the site often felt compelled to touch the exposed wood grain and joints while touring the construction—something you don’t see in steel or concrete buildings, Swinerton’s Silva said. The “people first” principle that drove the First Tech Federal Credit Union leadership team also benefited the environment. 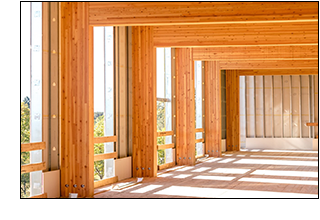 In addition to a beautiful, comfortable space that sits lightly in its park setting, the Sustainable Forestry Initiative timber used in the building provides renewable advantages over more traditional steel or concrete structures. 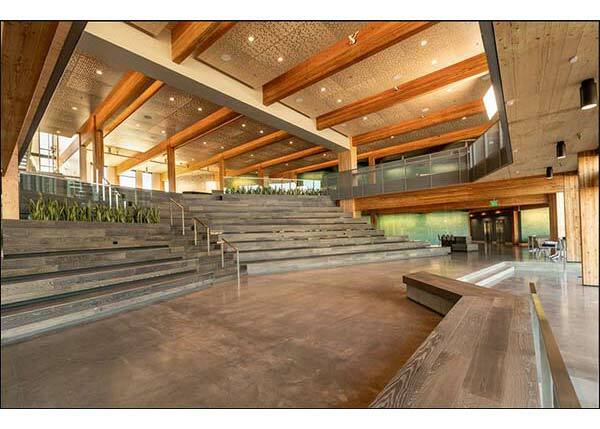 Silva estimated that it would take Oregon only 46 minutes to regrow the amount of wood used in the building. Trees store carbon as they grow, and the resulting wood isolates it long term. Engineered wood uses less energy and emits less greenhouse gases than steel or concrete during manufacturing, resulting in a greener footprint. Silva estimated that First Tech’s corporate offices sequestered 4,192 metric tons (4,621 U.S. tons) of carbon and avoided 1,622 metric tons (1,788 U.S. tons) of greenhouse gases that would have been emitted through steel manufacturing and construction. That’s equivalent to removing 1,229 cars from the road for one year. “The wood building is at home on that site,” said architect Barton-Smith. APA has a long and extensive history in building codes and standards development activities. It serves, for example, as the sponsor for the standing committees of U.S. Voluntary Product Standard PS 1 for Structural Plywood, the consensus softwood plywood standard, and Voluntary Product Standard PS 2, the U.S. harmonized performance standard developed under the U.S.-Canada Free Trade Agreement. It has developed performance standards over the years for numerous products, including engineered wood siding, engineered wood rim boards, structural insulated panels and prefabricated wood I-joists. 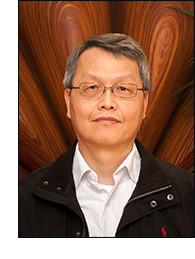 Dr. Borjen “BJ” Yeh, P.E., Technical Services Director for APA – The Engineered Wood Association, has been with APA for 29 years, serving as director of the Technical Services Division since 2003. He is a recipient of ASTM International’s Award of Merit, the highest award granted by the ASTM to an individual member for distinguished service and outstanding participation in ASTM International committee activities. Dr. Yeh received ASTM’s L.J. Markwardt Award in 2006. Dr. Yeh is currently the chair of the ASTM D07.02 Subcommittee on Lumber and Engineered Wood Products and the chair of the Canadian Standards Association (CSA) A369 Technical Committee on Wood-Based Panels. He is also the secretariat for ANSI/APA Standards Committees on glulam (three ANSI standards), structural insulated panels, engineered wood siding, engineered wood rim boards and cross-laminated timber and serves on several technical committees and professional societies in the U.S., Canada and internationally. Dr. Yeh earned his M.S. at Iowa State University and Ph.D. at University of California, Berkeley, is a registered professional engineer in the State of Washington and has written numerous journal articles and research reports. Designers Circle is a quarterly newsletter for building design professionals. Opt in to the newsletter from your user profile, accessible under "My APA" after log in. Elson S. Floyd Cultural Center at Washington State University emulates rolling prairies of the Palouse, native to the Nez Perce Indians.